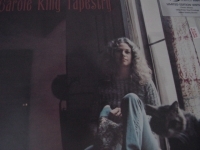 "Carole King, Tapestry - 180 Gram Silver Sticker - CURRENTLY OUT OF STOCK"
Simply Vinyl 180 Gram Limited Edition Analog Virgin Vinyl, Grammy award winning effort in 1971, voted the #39 album of all time". Tracks Include:Feel The Earth Move" "So Far Away" "It's Too Late" "Home Again" "Beautiful" "Way Over Yonder" "Out In The Cold" "You've Got A Friend" "Where You Lead" "Will You Love Me Tomorrow?" "Smackwater Jack" "Tapestry" "(You Make Me Feel Like)A Natural Woman" "Smackwater Jack (Previously Unreleased Live Version)"